Acrylic Sealant from Anabond is used mostly in the construction industry. It is a fast drying adhesive compound offering a superior holding strength with good flexibility in the application area. They are single component sealants which exhibit superior weathering properties and are used to seal gaps in construction before painting. 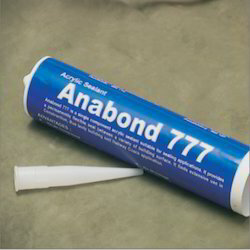 Anabond 777 Acrylic Sealant is single component system that cures at room temperature and produces a flexible seal with non-yellowing properties, Anabond 777 while curing forms a tough and resilient bond in civil engineering applications. Water proof sealing of air conditioning room,clean room, cold storage, laboratory etc. Looking for Acrylic Sealant ?